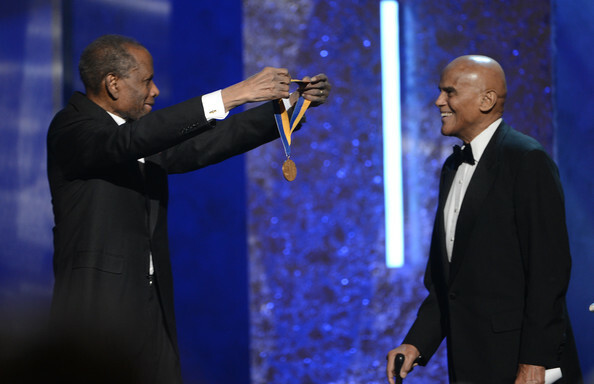 MEDAL OF HONOUR: Belafonte walks onstage to collect the award from Sidney Poitier. On Friday, Feb. 1, legendary artist and activist Harry Belafonte received a standing ovation and prolonged applause as he graciously accepted the 2012 Spingarn Medal during the 44th Annual NAACP Image Awards ceremony at the Shrine Auditorium in Los Angeles. Oscar winner and fellow entertainment icon Sidney Poitier made the presentation. Belafonte used the platform of his acceptance speech (see below) to exhort the country’s leaders to pay greater attention to such challenging and increasingly pertinent issues as gun control and the pitfalls facing Black youth. Presented annually by the National Association for the Advancement of Colored People (NAACP), the Spingarn Medal recognizes outstanding achievement by an African-American. Consisting of a gold medal, the award was created in 1914 by Joel Elias Spingarn, Chairman of the Board of the NAACP, and was first awarded to biologist Ernest E. Just in 1915. Well-known past recipients of the award include W. E. B. Du Bois, George Washington Carver, Marian Anderson, Paul Robeson, Thurgood Marshall, Jackie Robinson, Langston Hughes, Sammy Davis Jr., Alex Haley, Rosa Parks, Lena Horne, Jesse Jackson, Colin Powell, Maya Angelou, and Dr. Martin Luther King Jr.